NASA's Cassini spacecraft arrived in orbit around Saturn on the night of June 30, 2004. 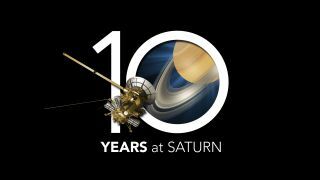 A new NASA video looks back at the Cassini spacecraft's arrival at Saturn, which happened 10 years ago next week. The Cassini flashback video, which NASA released Tuesday (June 24), shows the tense scene at mission control at the Jet Propulsion Laboratory in Pasadena, California, on the night of June 30, 2004, as the probe prepared to execute a crucial engine burn that would allow it to enter orbit around Saturn. This was a huge moment — one that the mission team had been waiting for since Cassini launched in October 1997. "The flight team is in place for SOI — that is, Saturn orbit insertion," the mission commentator said at the time, as captured in the new NASA video. "That is when the spacecraft must be captured by Saturn's gravity, or it will fly right on past the planet and the mission will be over." Cassini executed the maneuver perfectly, of course, eliciting cheers and congratulatory hugs and handshakes throughout mission control. Cassini has continued studying the planet and its rings ever since, making a number of landmark discoveries along the way. For example, the probe spotted plumes of water vapor erupting from the south polar region of Enceladus, the planet's sixth-largest moon, suggesting that an ocean of liquid water sloshes beneath the satellite's icy shell. Furthermore, in January 2005, Cassini dropped a probe called Huygens onto the surface of Titan, marking the first-ever landing on a moon in the outer solar system. Cassini is slated to keep studying Saturn and its rings and moons for several more years. The spacecraft is scheduled to end its life with an intentional dive into Saturn's thick atmosphere in September 2017.